Pepwave Max BR1 Cellular Router includes 2 antenna ports to attach external cellular antennas. See below for different options for high gain and high performance indoor and outdoor antennas to improve the signal strength and indoor coverage. Additionally, see below for RF bidirectional amplifiers/ distributed antenna systems/ repeaters/ small cells to further improve indoor coverage without directly attaching pigtail/ cable the device. See below for the most popular LTE antenna kits to boost the signal of your Pepwave Max BR1 Cellular Router. These kits include cables, lightning protection, and all required pigtails/ adapters. If none of these pre-configured kits works for you, see below for customized solutions. Also available with 100 ft cable RFWY12-MAX-BR1-100 or see below for custom configuration. Also available with 100 ft cable RFWP10-MAX-BR1-100 or see below for custom configuration. Also available with 100 ft cable RFW0M9-MAX-BR1-100 or see below for custom configuration. Find other signal booster kits for Peplink devices. STEP 1: Your Pepwave Max BR1 Cellular Router operates on these frequency bands: LTE Band 2, LTE Band 4, LTE Band 5, LTE Band 13, LTE Band 17, LTE Band 25. Determine what frequency bands your operator uses here, then click on the frequency band link to view the best rated 4G LTE antennas compatible with the frequency band that both your device and your cellular operator supports. 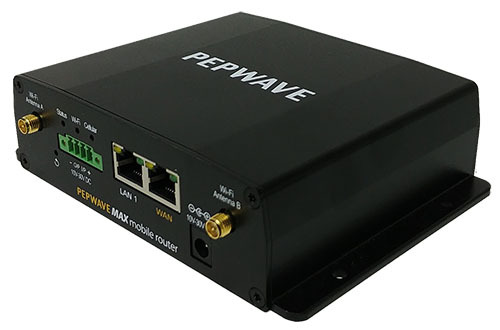 Pepwave Max BR1 Cellular Router includes an antenna port to attach external WLAN antennas. See below for different options for high gain and high performance indoor and outdoor antennas to improve the signal strength and indoor coverage.